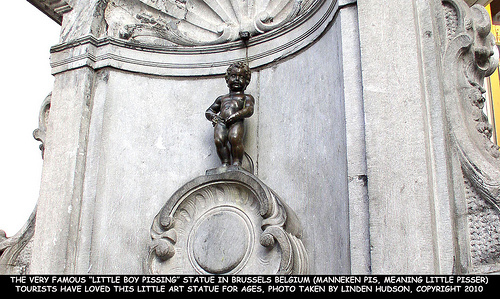 This snapshot taken by Linden Hudson in Brussels Belgium in 2010 while backpacking and guzzling beer. This statue originated here in 1618 and was re-built or replaced (upgrade?) in 1965 according to lore. The rebuild was probably also for putting the water pump in to make it piss. Tourists dig this little landmark.